While there’s no doubt that your child’s first Christmas was an extra special milestone, it’s not until they reach their second Christmas that they start to become aware of the magic that surrounds this festive time of the year. Okay, so they’re not quite gonna get the concept of a big man in a red suit rattling down the chimney while they’re sleeping, but they’ll get excited by the stash of presents under the tree and the grannies, grandads, aunts and uncles all gathering round to tuck into a glorious turkey as Christmas music jingles in the background. The other big difference is the toys now become the centre of attention. Last year, they may have been more interested in ripping up the wrapping for hours on end than playing with whatever was inside. This year, they’ll have watched their favourite Cbeebies programme, they’ll have seen older brothers and sisters or kids in the street playing with exciting toys. They’ll have watched their favourite Disney film. So this Christmas, there’s a slight pressure on you to get it right. To purchase them something that will induce hours of entertainment, rather than something that will be poked and prodded then chucked to the side. So if you’re stuck for inspiration, we’ve written a wishlist that covers the best Christmas gifts for a two year old in the shops right now. You’ll be struggling to keep up once they get the hang of this balance bike! Balance bikes are one of the latest crazes and at two years old, your child is at the perfect age to own one. They start by encouraging the natural foot in front of the other action to push the bike along. With confidence and encouragement, they’ll soon be lifting their feet off the floor and balancing all on their own! In an age where technology has taken over, these clever toys bring the excitement back to getting out in the fresh air and family walks become less of a struggle with the little ones scooting along beside you - win win. Best for: Engaging | Type: Book | Educational: Learning to speak | Power type: Reading power! Could become repetitive for parents! You may have heard of this book already. It’s world-famous, and almost a rite of passage for two year olds and their parents. This timeless story book uses playful language to engage young children, who are able to relate to the actions and engage with the behaviour portrayed in the book. We’ll hedge bets that this story will be a favourite at bedtimes for many years to come. A solution to boredom and getting them outside in dry weather! 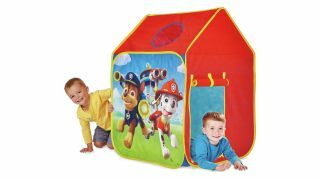 You can’t go wrong with a pop-up play tent, inspired by one of their favourite shows. With a roll up window and a hole in the roof to peek out from, there’s no end to the fun and games that can be invented. From hide-and-seek to helping them engage with their favourite characters in make-up games, this will be a hit for inside use in the chilly months and outside use in the summer. No camping though. Sometimes it’s just too hard to leave your favourite cuddly toys behind. Now, your child can pack their favourites in their rucksack ready to introduce to nan and grandad or another relative as soon as you arrive at their door. Lightweight and perfectly sized, this bag is proportioned just right for your two year old to feel like they’re doing their bit to help get ready for the day ahead. Occasionally, we all need a some quiet time, including the kids. So whether you need to get the washing done without a two year old tripping you up, or they’re feeling a little sniffly and want to cuddle on the sofa with their favourite fluffy toy in tow, this Peppa Pig DVD set will keep them entertained for hours. How many times have you pushed your two year old round the supermarket trying to ward off a tantrum as you try and pick your dinner ingredients for the week ahead? It may seem a little ironic then that this basic cash register by learning leaders, Leapfrog, is a fantastic introduction to interactive learning and imaginative play. For now, they’ll be happy with pretend money! The Toy Story films will never fail to be family classics, and now your little one can race around the house like Woody whenever they want. With a hat and red handkerchief included with the costume, they can really get into character, using their imaginations to lead the rest of their toys into all sorts of mischief. Next year, they’ll be wanting a Buzz Lightyear costume too!